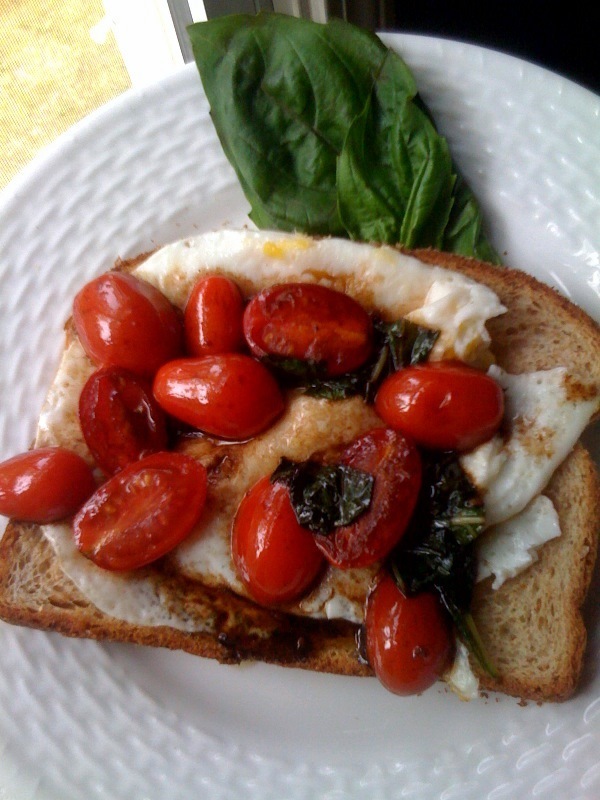 I like to start my day with protein, so a gently fried egg on whole grain toast is standard fare for me. Today I added some delicious cherry tomatoes. Toast a piece of whole grain bread. I like to butter it, but that's optional. Gently saute an organic or farm fresh egg (I break the yolk as it's less messy to eat) until cooked through. That should be a minute or two on each side. Cook the egg slowly over low heat to keep it tender. Place the egg on the toast and then add a little bit of olive oil and balsamic vinegar to the saute pan. Add 3-4 sliced cherry tomatoes and a few slices of fresh basil. Saute for about 2 minutes. Pour the tomatoes over the egg and enjoy! Tomatoes are a wonderful addition this time of year.